Steal the show at your next party with the EL (Electro Luminescent) wire from LED Montreal. Light up your stage or Halloween costume with this cool gadget. The EL wire features 3 modes, always on, slow flash and fast flash. Spanning 3 meters long and 2.3mm thick, the EL wire is offered in 7 colors: red, white, blue, orange, lime green, dark green and pink. For full portability the EL and can be powered by a battery pack of 2XAA batteries or 8XAA for extended usage or longer sections (Note that the batteries are not included). The battery pack may make a slight hissing noise when in use. This is due to the DC inverter and rest assured that the product is safe for the user. The El wire can also be connected to a standard 120V outlet with the power adapter kit should you wish to use it for a permanent display. We have also added a sound activated controller! Note that the sound activated controller for EL Wire is only available in a battery pack version (2 non included AA batteries). You can select a mode that will flash with the ambient sound, a always-on mode and 2 flashing modes. 10 meters can run on 12V AC. 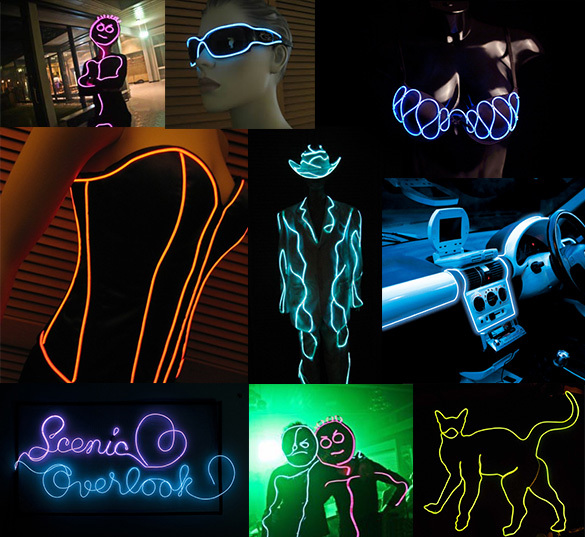 What is the best way to attach EL wire to flat surfaces, signs, walls, large flat letters, etc? Can the EL wire be used outside in the cold and how flexible is it? Can we uncoil in the cold without breaking? The EL wire is very flexible and can be used at temperatures of up to -10 Celcius. We have had some clients using them outdoors for short term events without any issues. Can the EL wire be cut into several pieces? If so, does each piece need to be powered separately? ideally they should all have their own power source. You can cut and extend but it's not easy to do, you need to solder the extension in place. Search on Youtube for: How to cut and extend EL wire. Is there an "always on" mode, or is it always flashing? Two questions: 1) I assume one of the 3 "blinking" modes is "not blinking", but steady light. Please confirm. 2) about how bright is the light, if it is possible to provide some sort of example. Thanks! The EL wire features 3 modes, always on, slow flash and fast flash. The wire generate a light similar to burning ambers. For the best results, use in a dark environment.